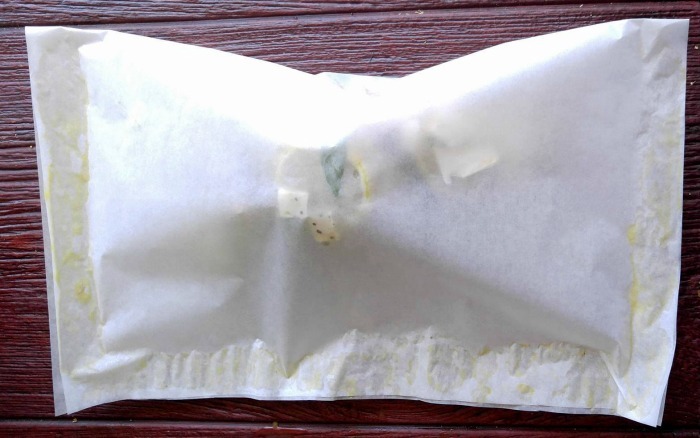 Typically, folded parchment paper is used but al foil, paper bags or other materials can also be used. Each individual parcel holds in moisture to steam the food. 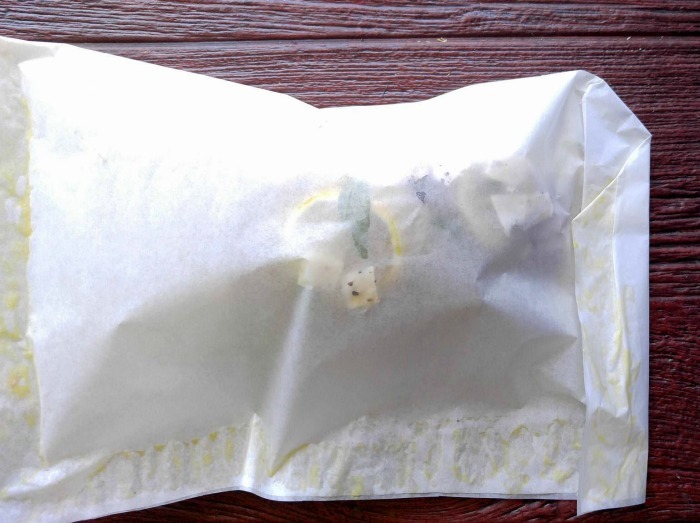 This tutorial will show you how to cook in parchment paper in just a few easy step that are simple to follow. Cooking in Parchment Paper is perfect for tender, low fat foods that taste delicious. Cooking in parchment paper pouches traps the steam inside the pouch and gives you flakey fish that is also very healthy and just full of flavor. Creating the pouch may look difficult, but it isn’t. It just requires a specific shape and folding technique. You can cook a variety of foods in parchment paper. I have tried chicken, shellfish, salmon and so many other varieties of fish. The vegetables are endless. They just need careful slicing to make sure that they cook quickly. White wine, fresh herbs, chicken stock and spices are also often used. Cooking in parchment paper is a wonderful way to cook if you are trying to watch your weight. The technique creates naturally low-fat foods since the process doesn’t require much in the way of added fats or oils. 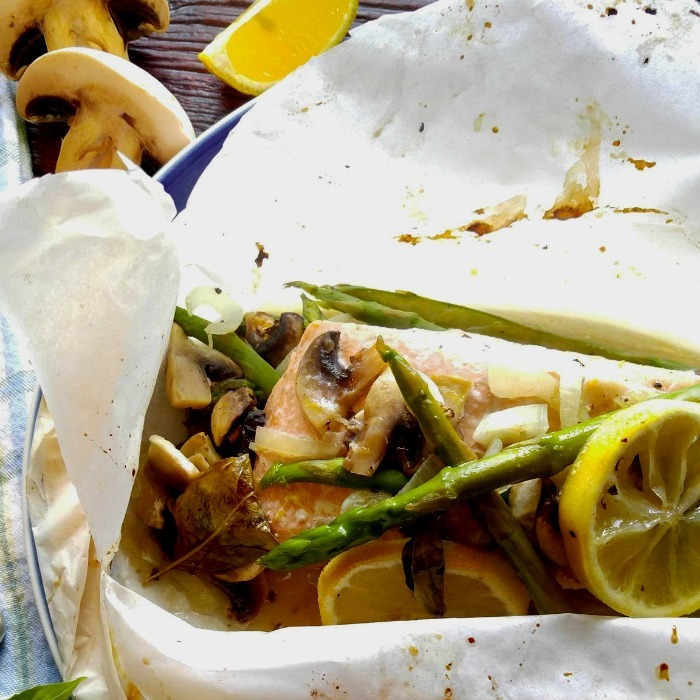 How to fold parchment paper to cook fish en papillote. 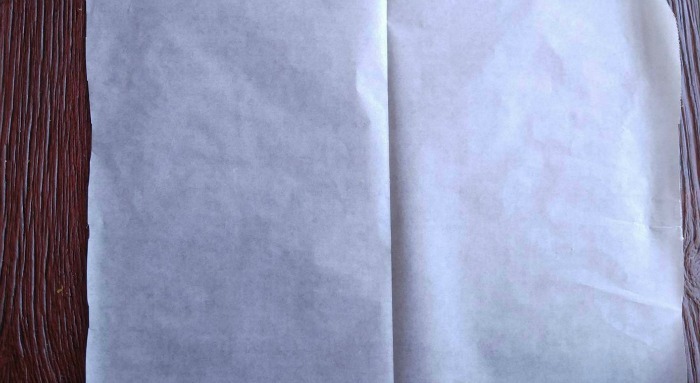 Start with a large piece of parchment paper. I cut mine 15 inches wide and about 17 inches long. The size depends on the amount that you will be putting in the parcels. 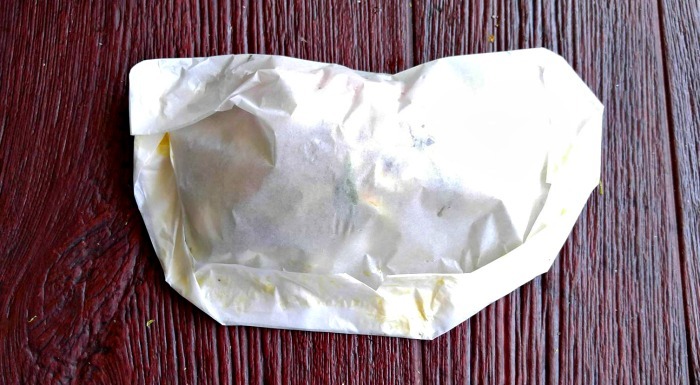 Fold the paper in half to give you an idea of where to place your foods. Place your foods about 1 inch to the left of the fold. You can add whatever you would like. Any fish works well, or chicken breasts. Vegetables should be cut depending on the protein you used. The next step is to use a pastry brush and brush a beaten egg around three corners of the paper that surround the food. Doing this will help the edges to seal well and make the folding easier. Fold over the paper to make a large rectangle and push the brushed egg edges together. The package looks done at his stage, but you can’t stop here. The seal is not strong enough to stay shut during cooking, so pleating the paper is required. Starting at one end, make a large fold in the shape of a triangle and push it down well. Each pleat will be formed about half way through the fold that comes before it, so it is easy to judge where to make the next one. Continue working around the edge of the food, making larger pleats on the longer edge and then shorter triangles as you get closer to the end. When you get to the end, make the last fold and tuck it under the packet and fold very tightly. You will end up with a half moon shaped package. All that is left to do now is to place the packages on a baking sheet and cook them in a preheated 400º F oven for about 15 minutes for fish. (longer for other proteins.) I use a vented pizza pan to cook mine on to allow extra heat to speed up the cooking process. Be very careful when you open the package. I used sharp kitchen shears to cut a slit an then made a long cut and opened it at the edges to allow the steam to disperse. 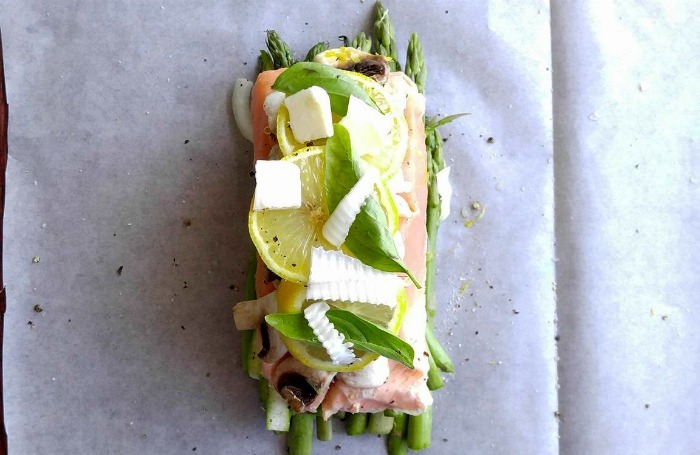 This recipe is salmon, asparagus and mushrooms with white wine and lemon cooked in parchment paper. It is probably the tastiest way I have ever cooked fish! You can get the recipe here. 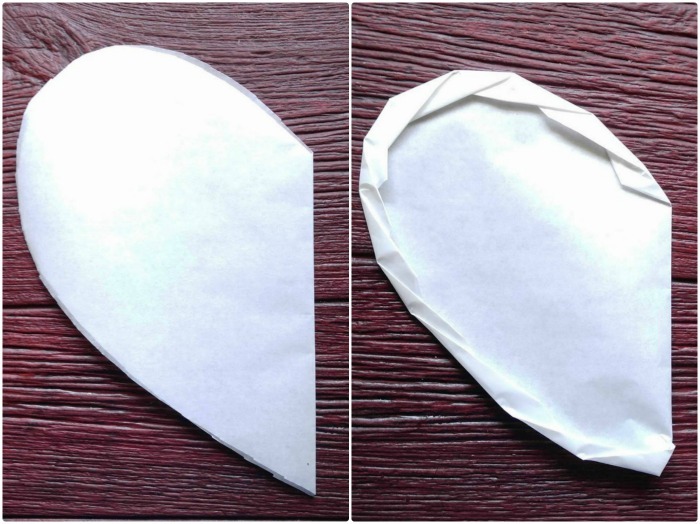 Another way to make parchment paper parcels is folding the paper in half and cutting it into a heart shape. This is done much in the same way that we used when we were younger to make home made Valentine’s Day cards. This method requires a bit less folding and makes a slightly smaller package. To do this, just start folding from the rounded edge using the same technique as the method above. This would be the perfect way to do these for a special Valentine’s day dinner! Whichever way you choose to do this technique, cooking in parchment packets gives you tons of flavor rewards without very much effort. All that is needed it to just toss a few ingredients onto the parchment paper, fold it and then let the parcels do the work for you. They deliver amazing flavor, lock in the goodness and moisture and are impressive looking, as well. Do you like cooking with parchment paper? Be sure to have a look at my latest tutorial. 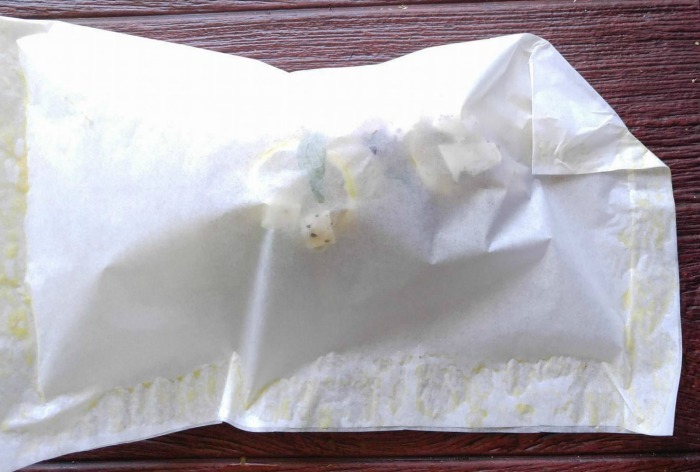 I’ve put together a list of 30 creative ways to use parchment paper. Some of them you may not have considered. Have you ever cooked in parchment paper parcels? How did you like the food? How early in the day could you prepare the papiollette, for cooking later? Same questions I have. I’m having 10 guest over for dinner. I’d like to know how soon I can prepare the fish without the paper getting soggy.